Lent started so well. The confluence of Ash Wednesday with St Valentine's Day brought forth a flood of articles and memes, of hearts and ashen crosses and words of love. The day ended with news of the latest sickening, senseless shooting spree in an American school, with ashes mingling with tears and hearts broken open. But there was love, too, not just in words but in deeds, especially those of Aaron Feis, the football coach who died shielding children from the gunfire, and others whose prompt, selfless actions saved lives. Lent is the ideal time to unmask [...] temptations, to allow our hearts to beat once more in tune with the vibrant heart of Jesus. The whole of the Lenten season is imbued with this conviction, which we could say is echoed by three words offered to us in order to rekindle the heart of the believer: pause, see and return. The vibrant Heart of Jesus... vibrant is not a word generally attributed to the Heart of Jesus, but maybe it should be. It speaks of energy and vigour, of vitality, passion and bursting with liveliness and life, all of which are found in the Heart of Jesus - and not just found within it, but bursting and overflowing from it. And it speaks of the vim and vigour with which our hearts too can beat; even - especially - when the world's cruelty and suffering can make us feel bruised and so very weary. 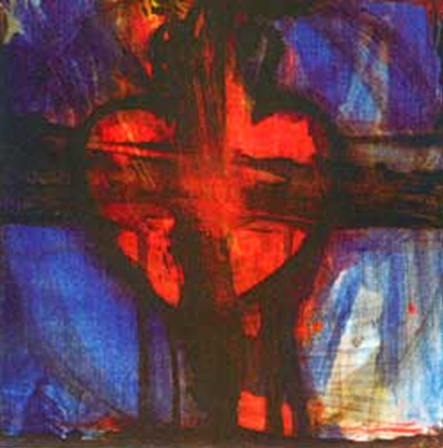 As I ruminated on this vibrant Heart this image - Herz-Kreuz by Manfred Bugl - came to me. It was given to my probation (group with whom I prepared for perpetual vows) when we were given our group name, The Open and Welcoming Heart of Jesus. I've loved it ever since; loved its energy and vibrancy, its huge Heart bursting from a cross, transformed into arms thrown open in an exultant YES. This is a Heart which is truly alive, triumphing over death - one with whose beat I'd certainly want mine to be in tune. In the whole Gospel, Jesus reveals to us that He is Life, but this revelation culminates in... the open Heart... He did not come to give life to an ideal world: no, it is a wounded Heart that gives life to a world full of ambiguity, of suffering... this bursting forth of life, this superabundance of life springing from a Heart that has been touched by suffering. If this image needed a caption, and if the vibrant Heart needed an explanation, this surely would be it. And in this un-ideal world full of ambiguity and suffering, it can only be - it has to be - a wounded Heart which gives it the life it so desperately needs: a superabundance of life bursting forth from a Heart which has been wounded, yes, but which can still radiate the vibrancy of love with every beat. May this Lent become the ideal time to allow our own hearts to beat in tune with it.